heat kitchen appliance to 350 degrees. Grease or line 2 12-cup gem tins with paper liners. Cream softened cheese, applesauce, oil, and sugar till sleek. Add eggs one at a time and continue combination. Add oats, each flours, leavening, hydrogen carbonate, salt, and cinnamon. combine till simply combined (do not overmix!). Fill gem tins ? full, sprinkle with cinnamon sugar, if desired. Bake at 350 degrees for 16-18 minutes or till prime springs back or strip comes out clean. Enjoy! 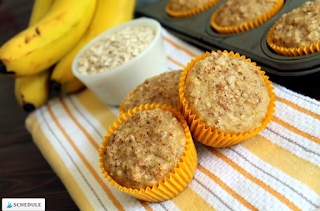 0 Response to "Oatmeal Banana Toddler Muffins"